THE SPECIALNESS OF The Tempest — something like a court masque, but altogether firmer, less evanescent — would have been seen by James I and its first audiences to have been in that very open-ness we are just learning to celebrate again: its meanings both firmly rooted, as in its celebration of royal power in the new plantation in James Town, Virginia; and at the same time free to change shapes at the behest of the royal master: to have, by good magic, freedom in space and time. 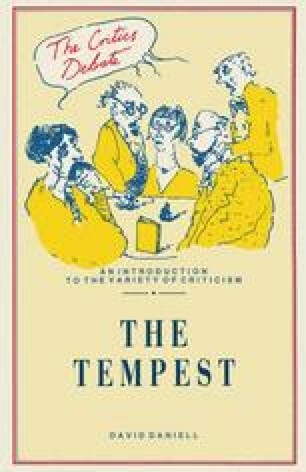 The Tempest is indeed a play which, though firmly established in the very front of the 1623 Folio, has continued a free life, successively turning into new shapes of great interest, from Milton’s Cornus to Auden’s The Sea and the Mirror from Fletcher to the late-twentieth-century Caribbean remakings. Other plays have been adapted: only The Tempest lives on in quite this remarkable way.